Clara Noyes’s gravestone in Duck River Cemetery, Old Lyme Connecticut. 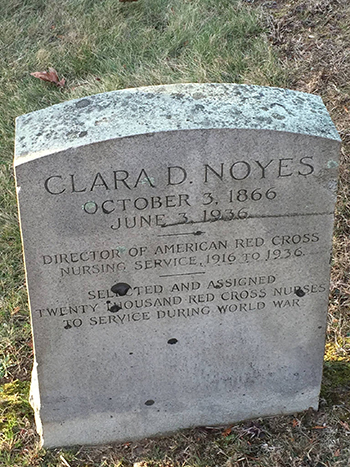 As her gravestone notes, Clara D. Noyes was responsible for helping to recruit, assign, mobilize and demobilize 20,000 nurses to serve sick and dying soldiers during World War I from her role as a leader at the American Red Cross Nursing Service. Noyes was recruited to this task by Red Cross Nursing Service founder Jane Delano, who told Noyes: “We must have a strong woman in Washington. There is too much at stake now to take any chances.” Noyes served as Delano’s lieutenant in the Nursing Service, until Delano’s death in 1919 during Delano’s fateful tour of post-war Europe. Following Delano’s death, Noyes soon assumed the post of Red Cross Nursing Service Director until her own death in 1936, collapsing at the wheel of her car from a heart attack on her commute to American Red Cross headquarters in Washington, D.C. In addition to her work recruiting war nurses, standardizing surgical dressings, and other wartime work, Clara Noyes was instrumental in the deployment of Red Cross nurses during the flu pandemic of 1918, the Mississippi Flood of 1927, and other major disasters. She also fought against unfair pay practices for war nurses and worked alongside former President William Howard Taft to promote, and successfully attain, military rank for nurses. During the post-war period, Noyes oversaw nursing relief activities in Europe and helped develop schools of Nursing in France, Bulgaria, Czechoslovakia and Poland. She was an early president of the American Nurses Association (ANA) during its formative years (1918-1922). Following her tenure as ANA President, she was its delegate on the influential Women’s Joint Congressional Committee. 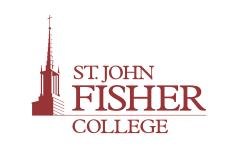 She also served as President of the National League for Nursing Education. Before rising through the ranks of the American Red Cross and the ANA, Clara Noyes also helped lead the first not-for-profit school for midwives in the United States at Bellevue Hospital, published extensively on nursing issues of the day, contributed frequently to the American Journal of Nursing (at one time serving as its editor), and held superintendent seats at nursing programs at St. Luke’s Hospital, the New England Hospital for Women and Children, and Bellevue Hospital. She was an 1896 graduate of the Johns Hopkins School of Nursing in Baltimore, and grew up in the town of Port Deposit, Maryland. Noyes, Roger L. Clara D. Noyes, R.N. : Life of a Global Nursing Leader (Manchester, VT: Shires Press, 2017).